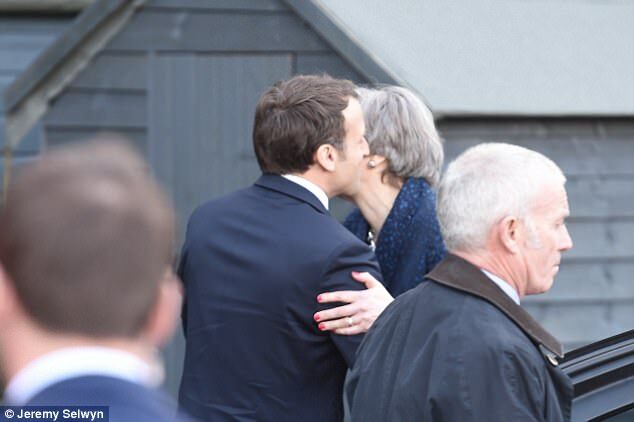 Theresa May took Emmanuel Macron for a pub lunch today as they tried to thrash out their differences at a UK-France summit. The leaders were spotted at the Royal Oak in the PM's Maidenhead constituency before kicking off the formal meeting at Sandhurst military academy this afternoon. 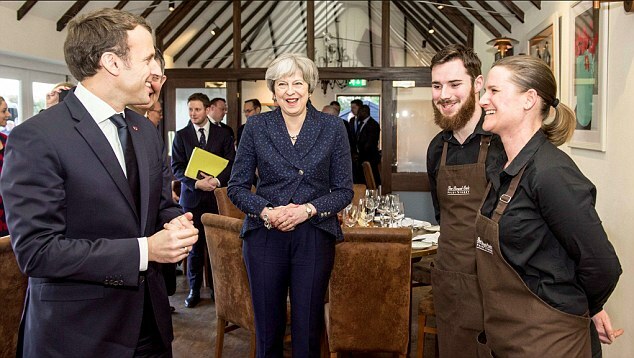 But there was little chance of Mr Macron having to make do with a bog-standard burger and chips - as the pub has a Michelin star and meals are prepared by last year's Masterchef: The Professionals winner. 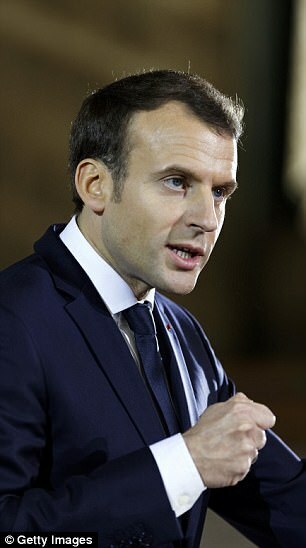 The French president is thought to be demanding more money to boost the Calais economy - despite Britain already bowing to requests for a £45million contribution to stop migrants sneaking across the Channel. They could also have difficult exchanges over Brexit, amid fears Mr Macron will block an early agreement on a transition deal in a bid to exploit business anxiety and poach jobs. The flashpoints risk overshadowing the summit, which both leaders hope will underline the commitment to close cooperation between the countries. 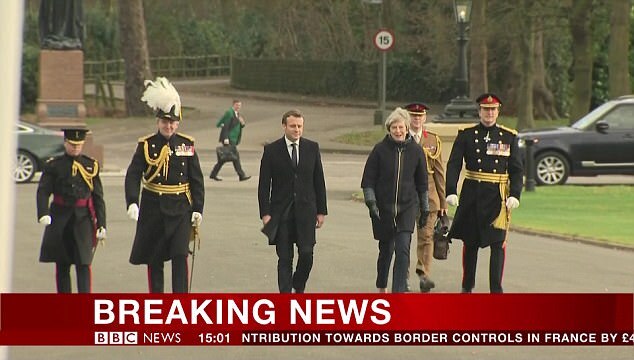 A military band struck up French national anthem La Marseillaise as they arrived at Sandhurst this afternoon before starting talks. Under the Le Touquet deal signed in 2003, border controls were located on the French side of the Channel in a bid to get rid of migrant camps like 'The Jungle'. 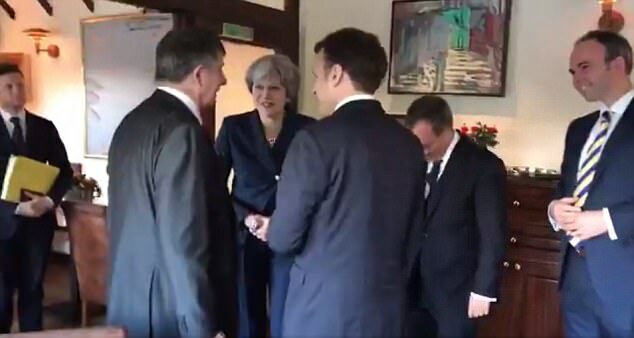 Mr Macron posted a video on his Twitter account of him walking into the pub with Mrs May, shaking hands with her team and chatting to staff. Chef Craig Johnson won the prestigious BBC show last year. Dishes on the menu include Roast Partridge, Foie Gras and Leg Bon-Bon, Celeriac Purée and Savoy Cabbage for £27. 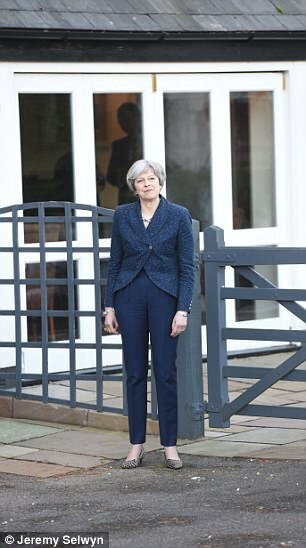 Critics claim the Prime Minister has been forced to stump up even more money for the defences after French threats to tear up the border agreement. UK taxpayers will foot the bill for extra measures to target stowaways using cross-Channel lorries, trains and ferries. In what is being seen as a sweetener to ease the deal, the French have offered Britain the loan of the Bayeux Tapestry. But even that prospect is in doubt after the mayor of the Normandy town where the artwork is currently on display imposed a series of conditions. He suggested that he might oppose the loan, or ask Britain to cover the cost of restoring the 11th century tapestry. 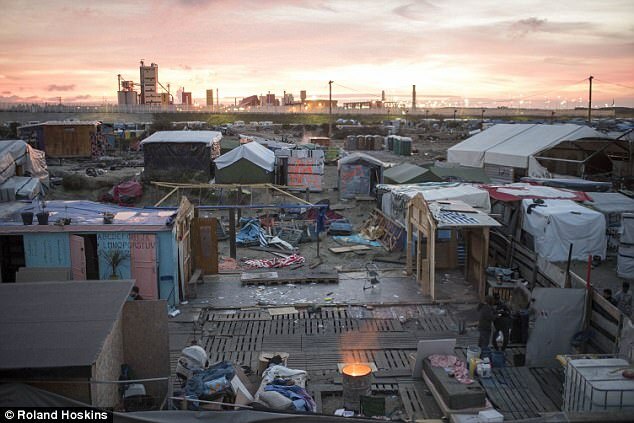 Mr Macron has vowed to stop Calais being a 'back door to Britain' – as long the UK stumps up more cash. The £45million will pay for security fencing, carbon dioxide detectors, heartbeat monitors and scanners to find stowaways. Britain has already spent around £167million over the past four years on security at Calais and other ports along the Channel. Under 'juxtaposed controls', the UK's border is effectively on French soil. 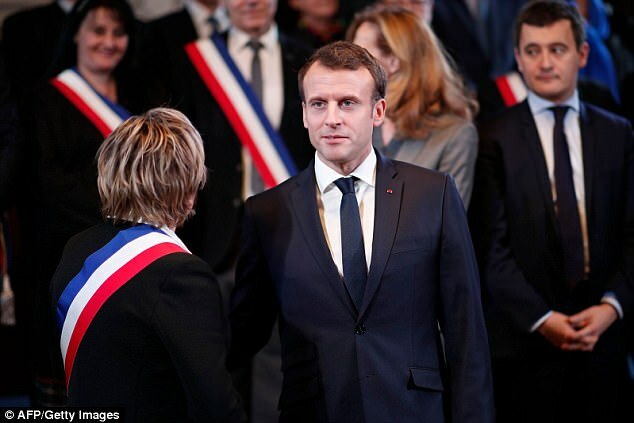 But according to The Times, Mr Macron is also seeking wider funds to boost the economy of Calais, saying it has been hit by the migrant issues. Mrs May is said to be resisting the pressure. The UK ambassador to France Ed Llewellyn did not deny the tensions this morning, but suggested the financial package would only cover security. 'Obviously the most important thing about the economy for Calais is that the migrant camps remain under control,' he told BBC Radio 4's Today programme. Government officials have dismissed the idea of handing over such funding as 'politically unsaleable'. Official figures in 2015 showed that one migrant was caught trying to sneak into the UK every six minutes, 84,000 in all. That fell to 30,000 last year – a mark of the success of additional security, said the Home Office. Charlie Elphicke, Tory MP for Dover, said: 'People will rightly ask why we are handing yet more money to France. Christopher Chope, a Conservative member of the Commons home affairs committee, said: 'We keep handing over money for security and France keeps coming back for more. Enough is enough. 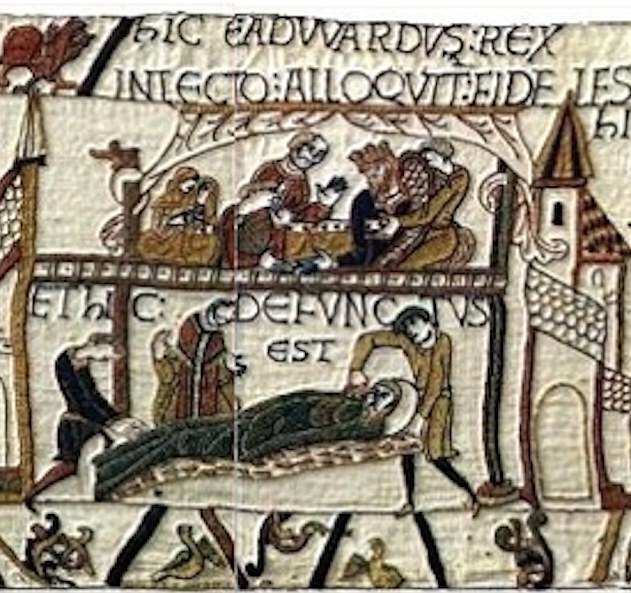 Former Cabinet minister John Redwood also said it was an 'unfortunate truth' that the Bayeux Tapestry showed England being invaded. 'Mr Macron comes with a rare gift-a loan the Bayeux tapestry to the UK. While I'm sure the offer is well meant, I will pass over the unfortunate truth that it depicts an invading French army killing England’s King & many in his army before taking over the govt of our kingdom,' he tweeted. Some French politicians have called for the border deal to be scrapped in the wake of Brexit, potentially allowing thousands of migrants to reach the shores of Kent. A Government spokesman said: 'This is about investing in and enhancing the security of the UK border. 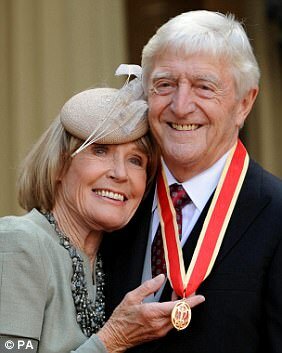 The Royal Oak in Paley Street is run by TV legend Sir Michael Parkinson and his son Nick. Nick convinced his father to help him take over the premises in 2001, with Sir Michael's wife Mary helping with the decor. The gardens around the 17th century building have been given an overhaul by horticultural expert Richard Vines and the interior boasts beamed ceilings and wooden floors. 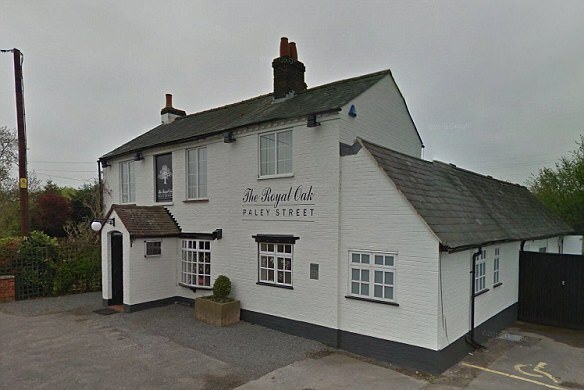 The food has become well known in the area and in 2010 The Royal Oak attained the acclaimed Michelin star. It also holds three AA Rosettes and a Bib Gourmand award. The lunch menu has starters crab raviolo with chilli jam for £13, roast quail and pine nut puree for £10 and Jerusalem artichoke soup for £7. Mains include guinea fowl, ham hock and pork pie with mash for £22, roast partridge and fois gras for £27 and Berkshire fillet steak with chops for £36. Desserts includ sticky toffee pudding with popcorn ice cream for £8, maple and pecan pie for £8.50, or a cheese board for £13.50. The website shows it serves Fuller's ales including Bengal Lancer and London's Pride. Funding will also help relocate migrants away from Channel ports to prevent the build-up of another 'Jungle' refugee camp. In 2015, Britain gave £12million to the French to enhance security measures, including a 9ft fence. Huge stretches were erected on the approaches to both the Eurotunnel terminal and the ferry port. A year later the Government handed over another £17million, including £1.9million for the 'Great Wall of Calais' around the port. Another £36million was announced a few months later. Mrs May hopes to get a two-year transition deal signed off at an EU summit in March so negotiations can swiftly move on to a future trade deal. Mrs May will use today's summit to announce greater cross-security co-operation. 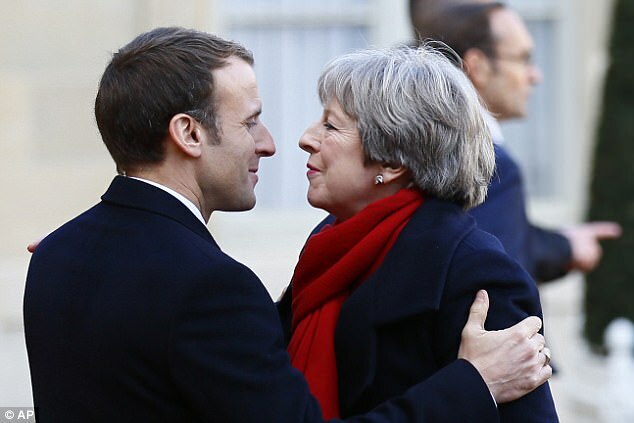 Yesterday France's president offered to lend the priceless work to Britain in a gesture Theresa May hailed as 'very significant'. But it seemed nobody asked the mayor of Bayeux – who has said 'non' unless 'certain conditions' are met. Officials insisted the masterpiece would not cross the Channel before 2023, that it would stay only a matter of months, and that it would happen in winter when fewer tourists visit Bayeux. Fancy a loan of Cleo's needle? So, what could we lend the French to remind them of ignominious defeat? A fragment of the Union Jack flown by the HMS Victory at the Battle of Trafalgar – when the British fleet smashed the French – was sold at Sotheby's yesterday for £300,000. An oil painting in the Victoria & Albert Museum of the British withstanding a French cavalry charge seems particularly fitting, as it was painted by one Felix Philippoteaux – a Frenchman. 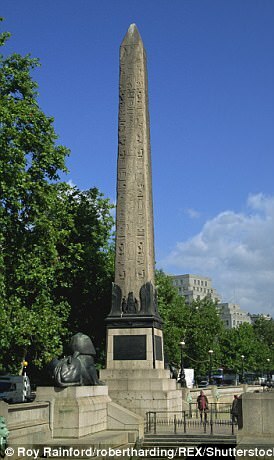 The monument, pictured, was given to the British from the ruler of Egypt to thank us for beating the French at the Battle of the Nile and the Battle of Alexandria.